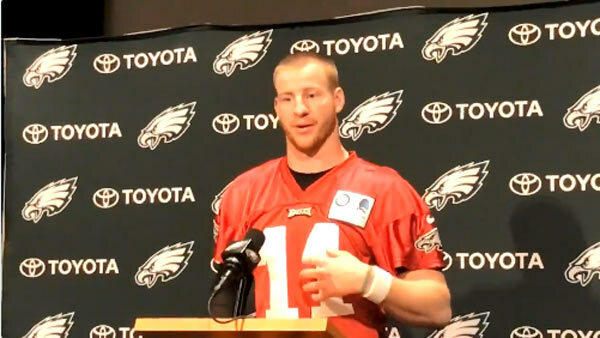 Philadelphia Eagles quarterback Carson Wentz speaks to reporters on May 22, 2018. SOUTH PHILADELPHIA (WPVI) -- Philadelphia Eagles quarterback Carson Wentz said he will be attending the White House visit moments before taking the field and throwing passes during OTAs. Wentz spoke to reporters Tuesday at the NovaCare Complex. Last week, Action News reported the Eagles were working out a June 5 visit to see President Donald Trump at the White House as part of their Super Bowl Championship recognitions. Fans react to Eagles going to the White House. Christie Ileto reports during Action News at 11 p.m. on May 17, 2018. During the press conference, Wentz was asked would he attend the visit. "Obviously, it's been kind of leaked out there that we will be going. The details aren't fully available yet, so we're not sure. I know for me personally, if the team decides as a whole, most guys want to go or be a part of it, I will be attending with them," Wentz said, adding, "I think it's just a cool way to receive the honor kind of nationally and be recognized. I don't personally view it - I know some people do, everyone has their own opinion on it - I don't view it as a political thing whatsoever. I don't really mess with politics very often, but I think I will be involved in going to that. Again, the rest of the details will come out soon." Moments later, the Eagles took the field at the team's practice facility for OTAs - Wentz included. Wentz is working on making a comeback after tearing his ACL and LCL last season. He was seen throwing pass after pass. And as Action News sports reports Jamie Apody tweeted, he looked "great." "Pretty amazing to see Carson Wentz do all the individual drills and look this good just 5.5 Months out. He's not doing the team stuff but I was impressed," Jamie tweeted. Will the Eagles make big moves at the NFL Draft?